Cameras with a retro look and feel are big business right now, a trend Olympus arguably started with its original E-P1 Compact System Camera (CSC) from 2009, which harked back to its maker's 'Pen' camera range of the 1950s/60s. Since then we've had the smaller Pentax Q, resembling a shrunken old SLR, plus the Fuji X100, X10 and X-Pro1, which have looked to traditional rangefinder models from Leica, with all its manual dials and knobs, for inspiration. 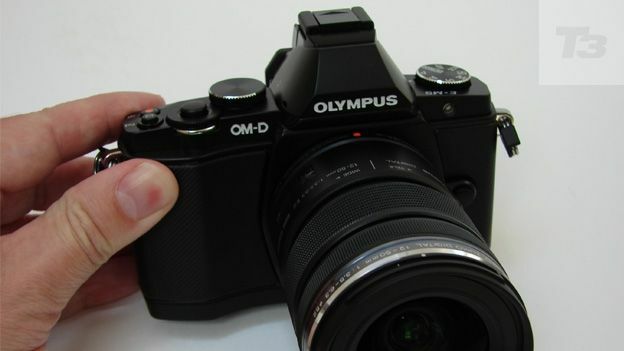 Falling between the two in looks and layout is the 16.1 megapixel Olympus OM-D – the highest resolution offered by its maker's interchangeable lens compacts to date – which, as the model name may suggest to older readers, is a digital re-imagining of a 40-year-old 'OM' camera chassis. The modern version also resembles a downsized SLR, and features a solid-feel magnesium alloy body, but is much slimmer than an actual SLR. As with rivals, this loss of bulk is down to the jettisoning of a traditional SLR mirror mechanism to bring sensor and lens closer together and allow for the compact(ish) size. That said the OM-D body is still too big a squeeze for all but a deep jacket pocket. This is a new range of cameras for Olympus, with the E-M5 being the first 'OM-D', although the crucial bits, including sensor and lens mount, are the same size ratio format as the manufacturer's existing Micro Four Thirds 'Pen' cameras. This means there's no need to re-invest in lenses if you already own a Pen camera. Older Olympus E-system lenses from its DSLRs can also be used via adapter. Current pricing for a black or silver finish OM-D E-M5 is £999 body only or £1149 with the 12-50mm zoom lens we were supplied with, equivalent to an 24-100mm on a 35mm camera. While that isn't cheap it compares favourably to rival cameras offering a similar degree of control plus enthusiast pleasing built-in viewfinder, such as the Nikon V1, the Sony NEX-7, which has a physically larger sensor and resolution, while the Olympus is £400 cheaper than Fuji's equally 'classic' X-Pro1. The OM-D's control layout is reasonably straightforward and shouldn't daunt any enthusiast photographer. Its mix of dedicated video and user-selectable function buttons, plus small backplate buttons, top plate command wheels and shooting mode dials – with manual and 'intelligent' auto options – are similar to what you'd find on a premium-end compact camera or entry-level digital SLR such as the Nikon D3200. If there is a niggle it's that the backplate buttons a little too tiny for personal taste, in that they necessitate fingertip precision. But at the same time we acknowledge this is partly down to the majority of the camera back being given over to a screen. Unlike Sony and Nikon competitors, the O-MD, as with the Olympus Pen models, has the advantage of automatic in-body image stabilisation. This means that specialist anti shake lenses aren't required, as any lens attached automatically becomes stabilised. In something of a world's first, Olympus' anti shake system here operates around five axis, to ensure that even if you're filming video and walking along at the same time, you'll get steady results. The result is greater flexibility for potential users. Competing directly with Sony's range-topping NEX-7 here is a rear screen on the Olympus that can be tilted 80° upwards, so the user is looking down into it, which is useful for otherwise awkward low angle shots, or alternatively pulled out and tilted 50° downwards, allowing the camera to be held higher and at arm's length with the screen still visible. Furthermore the 3-inch display in question is OLED rather than the standard LCD. This means deeper blacks and better contrast for easier viewing, with a middle of the range 610k-dot resolution aiding clarity. In addition, and as mentioned at the outset, the OM-D E-M5 finds room for a separate viewfinder window, here of the electronic variety (an EVF), directly above the larger screen. Offering a 100% field of view this is neatly operated by an eye sensor, which, upon detection, switches the EVF on and the screen below off. So this smaller viewer is not just an afterthought, Olympus has loaded it with a 1.44 million-dot resolution. Always good to have a choice of options for framing and reviewing shots, and the OM-D certainly provides that choice, meaning that it will find favour with enthusiasts looking for an alternative to that DSLR that still in many ways handles like a 'proper' camera. The Olympus OM-D E-M5 is supplied with a BLN-1 rechargeable lithium ion pack that slots firmly into the base of the handgrip. This is good for up to 330 shots from a full charge, which is par for the course for this class of camera without being anything special, considering the Sony NEX-7 offers 335 pictures from its own rechargeable battery, the Nikon V1 can achieve up to 400 pictures, but the Fuji X-Pro1 offers just 300 shots. Incidentally if you do go for the optional HLD-6 battery grip for the OM-D for around £200 that slots onto the camera base, this doubles battery life to 650 shots. Along with Panasonic and Nikon rivals, Olympus is also staking a claim for the world's fastest auto focus system with the OM-D, including the performance of actual DSLRs, and it's certainly a lot swifter in this respect than Fuji's X-Pro1. The E-M5 locks onto target as swift as your finger has finished fully pressing the shutter release button, which is exactly as you'd want it when spending a grand on a camera. However, unlike the Fuji, the Olympus isn't claiming that its image quality is a match for a professional DSLR with a larger 'full frame' sensor. This doesn't mean however that the pictures always look like snapshots and it is incapable of achieving DSLR-like results; far from it, and with the supplied lens – which, unusually, offers the choice of manual and mechanised operation - there's opportunity to achieve those shallow depth of field, subject sharp, background-blurred results, whilst even when shooting at maximum wide angle detail is maintained into the corners of the frame. In terms of shooting in low light, Olympus has claimed to us that results are 100 times better than its original Pen camera of three years ago, and, while that may be a little fanciful, here that means an ISO sensitivity range ramped up from ISO200 to ISO25600 – the same sort of spec as found on a semi pro DSLR. Unsurprisingly results are softened and washed out in appearance at top whack setting, but that near see-in-the-dark and shoot without flash facility is there if you want it. If not, a clip-on flash is provided in the box. For video shooters the clichéd 'whisper quiet' mechanised zoom provided with our review sample will prove a boon for those who require steady and constant transitional adjustments. Naturally the Olympus provides the option of Full HD 1920x1080 pixels clips, and with stereo sound. Focusing is also automatic whilst recording, so if you switch from one subject to another the camera will gently and almost seamlessly re-focus. Like its early digital Pen models, the 16.1 megapixel OM-D not only looks gorgeously retro, it backs up its backwards-inspired design with a rugged build that here is additionally splash proof and dustproof. In other words the kind of attention to detail you'd have formerly found on a semi pro or pro DSLR has been paid here. And, indeed, Olympus is hoping to get some take-up from wedding and social photographers for the OM-D range, alongside well-heeled consumers and photo enthusiasts, and was pushing a battery grip with initial orders that bulks out the set up further. Yes, £999 for a miniaturised camera body is a lot to ask, even if this one does come with an angle adjustable OLED screen plus 1.44-million dot electronic viewfinder for shot composition and review. But if you're not bothered about owning a digital SLR, then the OM-D E-M5 is the only one you could conceivably need. Along with the likes of Sony's NEX-7, it's a king among compacts.